Have you or yours been nearly got by pink slime? Remember when all we had to worry about was mutual assured destruction by nuclear warfare? Now we have learned that nuclear irradiation may even be good for you. But how could pink slime be good for you? The heating process liquefies the fat and facilitates the separation of lean beef from the fat and other meat by-products [of trimmings]. The recovered beef material is then processed, heated, and treated with gaseous ammonia or citric acid to kill E. coli, salmonella, and other bacteria. When gaseous ammonia is used, after coming in contact with water in the meat, it forms into ammonium hydroxide. The product is finely ground, compressed into pellets or blocks, flash frozen and then shipped for use as an additive. Not pretty but just how does one get a superbug normally acquired in a hospital from such an ishy thing as pink slime? What brought this up was one of those personal emails to myself and only 1000000000000000 other people begging for help eliminating pink slime from factory farms. Is pink slime from organic farms better somehow? The sender seems to be a high-powered lobbyist with her own firm and, I expect, probably does have a real concern about a lethal threat to one of her own children that was, also I expect, not connected with the ishy pink slime. I tried to find an email address. I refuse to do tweets and whatever. No doubt the lady’s testimony to the slimes in Congress will elicit horror from those honorable ladies and gentlemen who are only too familiar with slime but not so hot on science and technology along with the reporters covering such an event. Why am I writing here about it? You want I should bore the wife and dawgs with this? Computing power may be about to be elevated a million-fold or so with photons replacing electrons so that we can really be inundated with disinformation like never before. grind it yourself. 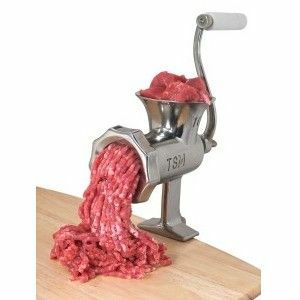 When I was a kid, I remember my grandmother attaching the meat grinder to the edge of the table and grinding chunks of beef through its funnel and into a bowl sitting beneath it. I was fascinated by the “wormy goo” that the grinder oozed into that bowl. I also remembered the yummy burgers, meatloaf and meatballs Grams made. So when I bought my first Kitchen Aid mixer, I also bought the meat grinder attachment. I haven’t purchased ground beef from a supermarket in years. It’s also cheaper. They still make these in various sizes, hand cranked and motorized.